As New Zealand moves ahead with its investigation of a massacre at two mosques, countries in Europe have launched a probe into the suspect's potential ties to the region. 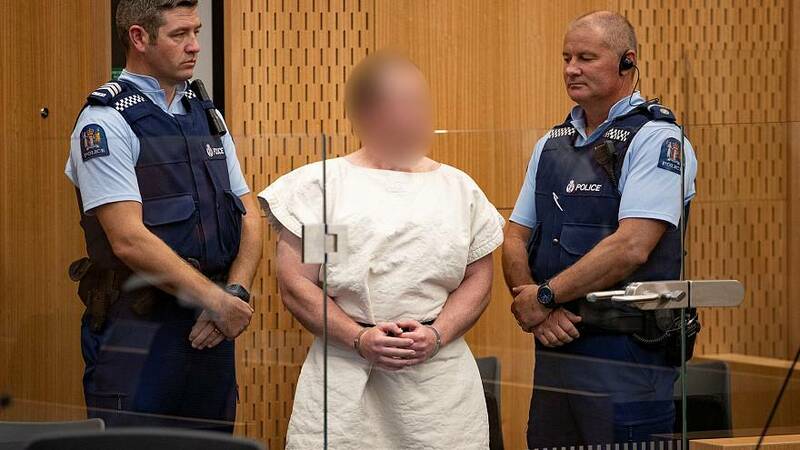 Brenton Harrison Tarrant, a 28-year-old Australian national, was charged with murder for the shooting deaths of at least 49 people during Friday prayers in Christchurch. He appeared in court on Saturday morning, shackled and wearing all-white prison garb, and showed no emotion when the judge read him one murder charge. Tarrant has been described by officials as a "right-wing extremist terrorist" and appeared to post a lengthy manifesto before the attack detailing his white-supremacist worldview. That global focus was coming under scrutiny Saturday, particularly the suspect's apparent interest in — and possible connections to — white European nationalism. As police in New Zealand prepare additional charges, authorities in Bulgaria and Turkey are probing the suspect's travels to the respective countries. New Zealand's Prime Minister Jacinda Arden said Saturday that the Australian citizen had been in and out of the country while also traveling the world. She said agencies would be piecing together his travel and the sequence of events that led to him getting a gun license. Tarrant's most recent visit to the country in November involved stops at historic sites in the capital Sofia and a number of other cities before traveling to neighboring Romania and Hungary, the prosecutor said. He also visited other Balkan nations Montenegro and Serbia in December 2016, Tsatsarov added, and he appeared to have good knowledge of the region's history. "We express our deepest condolences and do not want Bulgaria, which is an ethnically tolerant country, to be associated in any way with this horrible and unjustifiable act," said Interior Minister Mladen Marinov in a statement released to the Bulgarian news agency BTA. The prosecutor added Bulgarian officials were working with security partners across the globe, including Serbia and the United States. A senior Turkish official also confirmed Saturday that the suspect in the massacre had visited the country multiple times, including an "extended" visit, although they would not confirm when these travels occurred. The official told The Associated Press that an investigation into "the suspect's movements and contacts within the country" were underway. Mark Briskey, a lecturer in criminology at Murdoch University in Australia, told NBC News on Friday that references in the manifesto go "back to antiquity almost" and raise questions about which people or organizations may have influenced the suspect's ideology. The manifesto referred to the victims of a terror attack in Stockholm and racial tensions in the Balkans. The author says he was inspired by Charleston church shooter Dylann Roof as well as Anders Behring Breivik, the far-right terrorist who killed 77 people in Norway in 2011. The suspect also appeared to film Friday's attack on a head-mounted camera and live-streamed on Facebook, although that has not been confirmed by officials. The footage showed him listening to a Serbian folk song about Radovan Karadzic — the Bosnian Serb political leader convicted of war crimes including the 1995 genocide of Muslims in Srebrenica — before getting out of the car to retrieve a weapon. The video, and several images posted to social media that appear to tally with the incident, shows weapons scrawled with writing about Serbian knights who fought Ottoman Turks and Bosnians in the Middle Ages. The manifesto condemns the U.S.-led bombing of Yugoslavia, which began 20 years ago next week, saying that NATO "fought beside Muslims and slaughtered Christian Europeans attempting to remove these Islamic occupiers from Europe." Paul Spoonley, a professor at New Zealand's Massey University, said that the far-right has "been building for some time but it's still quite a minor part of the political spectrum in New Zealand." Speaking to Britain's Sky News, he said: "Somehow we thought we were exempt from it but that innocence has been completely blown away today. "Rather than focusing on only domestic grievances, white-supremacist nationalists are increasingly taking their cues from incidents around the world, championing international supporters of their cause and condemning what they see as injustices around the world," Spoonley added.